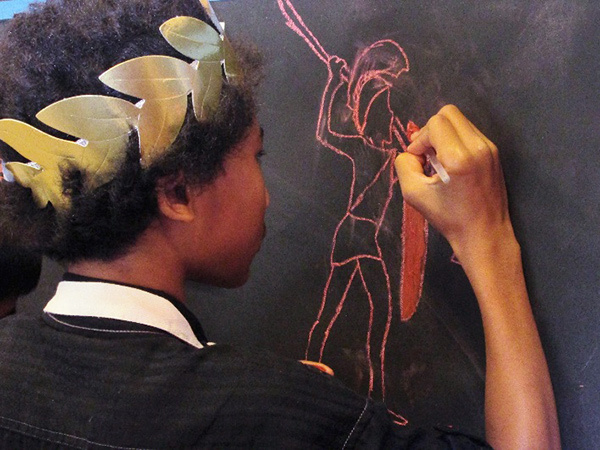 Imagine eight classrooms of approximately thirty-five middle school students working together to write, direct, and present a two-hour production of The Odyssey, complete with props, scenery, and costumes. The fearless sixth-grade teachers at Prairie Vista Middle School undertook this monumental effort. 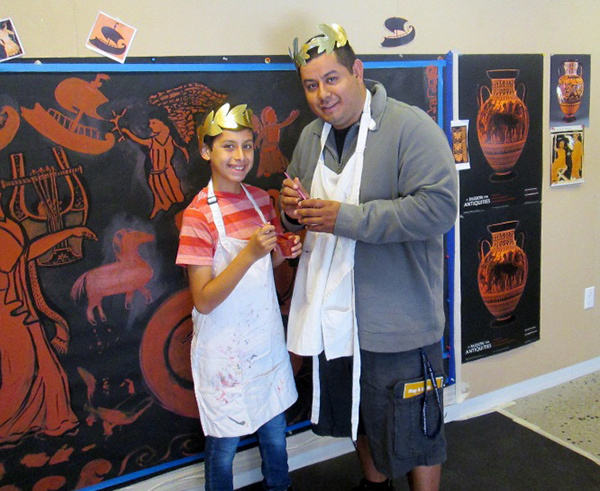 It was the culminating event of the Ancient Art Academy, a new program at the Getty Villa. 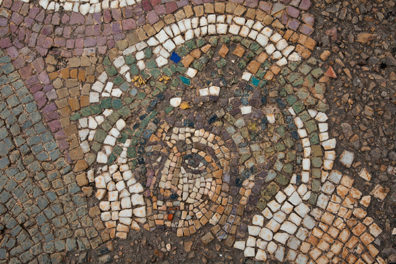 This was the inaugural year of the three-year program, which aims to expand students’ knowledge about ancient art in relation to storytelling, music, and theater. 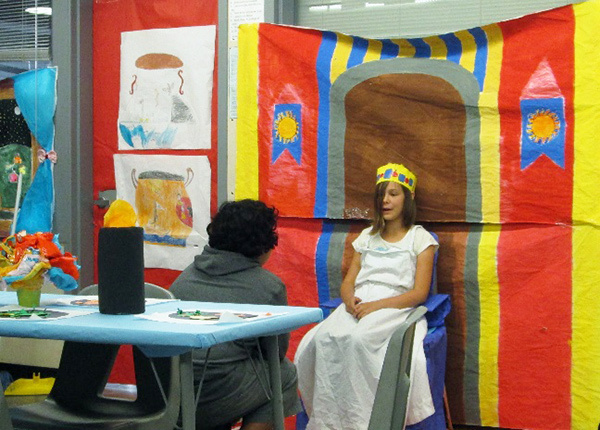 The Ancient Art Academy involved visits to the museum, art-making, role-playing, and, of course, the big performance. A Getty gallery educator first traveled to the students’ classrooms in anticipation of their two field trips to the Getty Villa. 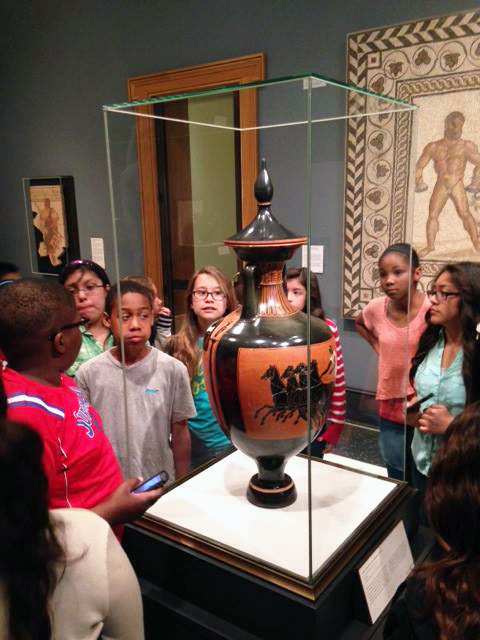 At the museum, docents taught students about daily life and storytelling in ancient Greece and Rome by focusing on mythological stories in artworks in the collection. 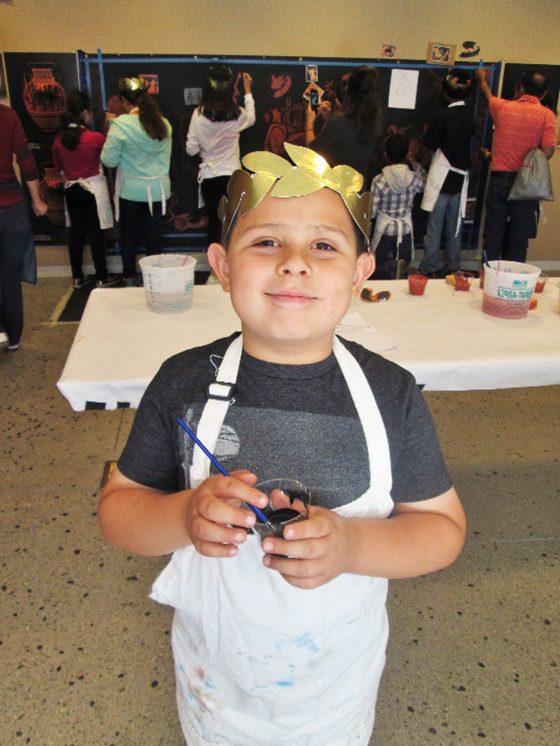 On June 6, the students invited their families and friends to the museum to explore the galleries and participate in art-making activities. The sixth-graders spoke with enthusiasm about their prior visits as they guided their families through the museum, discussing their favorite artworks and sharing their knowledge. 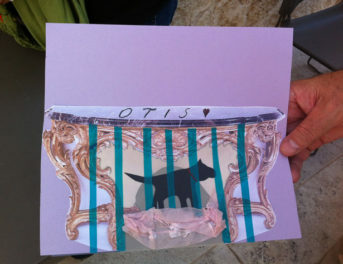 The objects in the Getty Villa’s collection were also a source of inspiration for the on-site art projects. 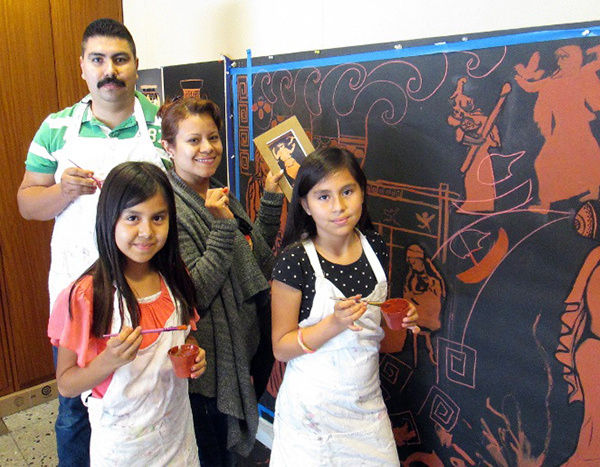 Families worked on a collaborative mural, which was later integrated into the final performance as a backdrop. Many families worked together to create a mural, which became the backdrop for the school production. A student carefully adds details to the mural. Some students, like this proud painter, got into character by dressing the part. Families learn the black-figure painting technique. Helen Marish, a talented local artist, developed this project for the event. 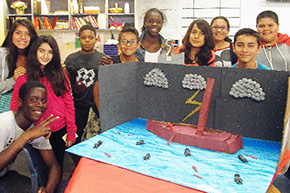 Students created models of the sets. In the true spirit of arts integration, the performance was the result of an outstanding cooperative effort between the eight subject area teachers including math, science, and language arts. The students and teachers demonstrated incredible dedication, flexibility, and perseverance by collaborating to present such an exceptional production. After a successful first year of the Ancient Art Academy, we at the Getty look forward to the next year of collaboration with the Prairie Vista Middle School as we continue this exciting, epic journey. If you’re interested in bringing similar projects into your own school, visit the Getty’s Resources for the Classroom page, which includes written and video lesson plans for Homer’s Odyssey. 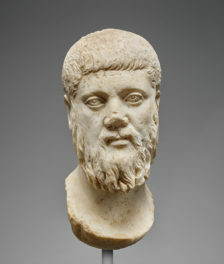 As the education specialist for school programs at the Getty Villa, I design experiences with and for the K–12 audience, connecting through our specialized collection of art objects from the ancient world. I oversee the school programs docents, create tour content, develop related pre- and post-tour materials, and support our teacher programs. I've been in museum education for 12 years, an art educator prior to that, and an artist always. I earned my BA in studio arts from Rollins College in Florida, and my master's of art education from Georgia State University.